Sometimes, the key to the best comfortable and stylish college bedding comes from your standard pillow sham. Sitting at the top of your Twin XL size bed as the fundamental place you lay your head at night, your standard size college pillow needs to have the perfect standard pillow sham covering it. 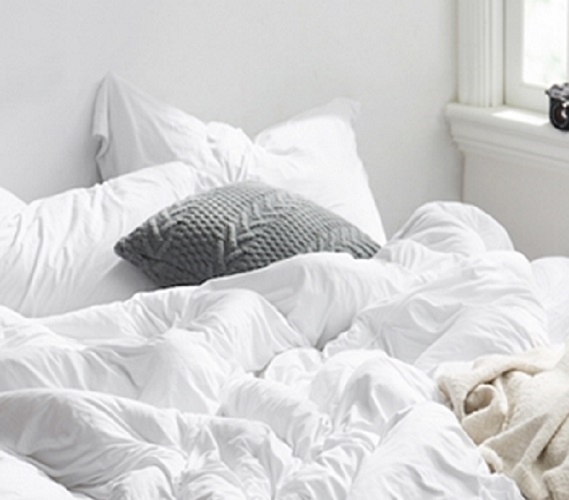 Well, if you're looking for Twin XL bedding perfection for your dorm room, you've found it! This cheap college bedding item is just what you need to give yourself incredibly comfortable and stylish dorm room bedding. First off, the Bare Bottom Sham - White is a great color in terms of dorm decor. White will match any other color so it will help you tie in your college comforter and the rest of your dorm room decor. But the real magic of this one-of-a-kind standard college pillow sham comes from its amazing comfort. Made with a very unique microfiber and spandex material, this dorm sham will cover your college pillow in incredibly silky soft comfort. You'll enjoy the feel of this white standard size dorm pillow sham so much you just may want to enjoy it for as long as possible, just make sure you get to class on time!